The last summer blockbuster has arrived in Elysium. District 9 director and writer, Neill Blomkamp ‘s continued run in the sci-fi genre provides an enjoyable experience. The setting of the story, is 2154 on a severely over-populated and diseased world. The rich and powerful abandon earth for an man-made utopia named Elysium. 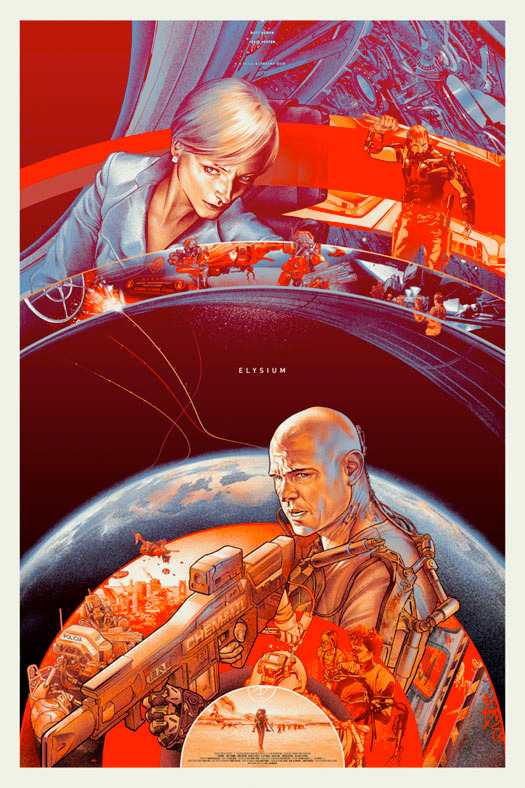 Elysium entertains with visceral action sequences and a futuristic and unique story that keeps you on your toes. Matt Damon who portrays the main character of the film, delivers another good performance in his role as Max Da Costa; a man with nothing to lose. Matt Damon is no rookie to action films. He is widely known for his tough bad boy persona in his roles in the Bourne films. He trained four hours a day to get physically and aesthetically equipped for the film. He certainly shows that he isn’t out of practice in the art of asskickery. The weakest performance in the film came from Wagner Moura who played Spyder; a human smuggler who takes people to Elysium. It wasn’t that he had bad acting necessarily but there was an apparent and jarring language barrier. Just seemed sort of forced and a better option probably would have been to to have him speak his native portuguese/spanish tongue especially considering that Max actually had an Hispanic ethnicity. The highlight of the film came from Sharlto Copley who plays the vicious and psychotic character C.M Kruger. Copley gives a powerful performance and steals the spotlight from the rest of the veteran cast. Even the cold and calculating Jodie Foster, who plays the secretary of defense of Elysium, doesn’t stand a chance to his ruthless and unhinged personality. He takes command of his role and puts a choke-hold on every scene he is in. Even though he is a mercenary who gets paid for his job he he takes pleasure in it all. Neill Blomkamp might be one of the only people in the film industry to acknowledge his talent so far, but that’s sure to change. The dense over populated and dirty sprawls of Earth are visually stunning. Wide angle shots of the swarming city of Los Angeles on Earth offer a stark contrast to the perfect and clean-cut nature of Elysium. The use of handycam is present in the film but it doesn’t distract me as much as it did in District 9 . The security/surveillance drones are masterfully crafted and have a sense of realism to them. Their design balances just the right amount of finesse, stiffness, and weight to be believable. The highlight from the cinematography and VFX team had to come from the combat and weaponry of the film. It was a truly a blast to watch the way some of the guns and gadgets worked. The plot and setting of story takes a look at the hardships of a possible future without proper medical care. This system only affords the wealthy and those with influence. Neill Blomkamp was quoted saying that this story was not an alternate future but it was actually a look at the present. Though the story was probably a bit more action oriented then District 9 its still offers some room for thought even if isn’t as deep as his previous work. All in all it was thoroughly entertaining. It’s the one of the best sci-fi films of the year and I recommend it. This entry was posted in Movie Reviews and tagged Blockbuster, drama, Elysium, entertainment, Film, Jodie Foster, Matt Damon, movie reviews, Movies, Neill Blomkamp, Review, sci-fi. Bookmark the permalink. Thanks man I enjoyed it. Saw it in IMAX too. Some solid scifi— my favorite genre.